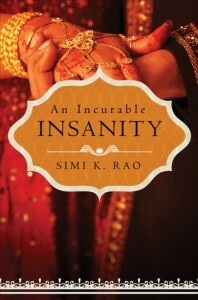 In An Incurable Insanity by Simi K. Rao, Shaan Ahuja finally gives in to the family pressure and agrees to an arranged marriage to a proper Indian bride, Ruhi Sharma.. His last foray into matters of the heart with an American girl had left him scarred and unwilling to try again. Marriage for him would be in name only and he makes the same clear to Ruhi on their wedding night. But will Shaan’s decision be fair on a girl who has woven so many dreams around her marriage..?? as his fingers gently tucked a lock of hair behind her ear. She let out a soft moan.